Kanyakumari is very popular for its tourist attractions that include historical sights and tourist attractions.Round the year, thousands of tourist travel to Kanyakumari to see the top tourist attractions in Kanyakumari from all over the world.Everyday you will find a good crowd on all of these Kanyakumari tourist attractions in India. You can visit these attractions any time as per the attractions timing. In Kanyakumari the most important tourist places are Vivekananda Rock, Kumari Amman Temple, Mahatma Gandhi Memorial, and Kanyakumari Temple. here we list out the top tourist attractions in Kanyakumari for you . Kanyakumari is said to be the southernmost point of the Indian peninsula and is an inescapable tourist destination of south India for the tourists. With its clear beaches and vast stretches of sands,it remains one of the most favored tourist spots for the visitors. It is also a popular temple town as it features some of the finest temples found in the state.Kanyakumari tourism, Hotels in Kanyakumari, Kanyakumari Tour Packages, Temples in Kanyakumari, Tour to Kanyakumari, Travel Packages for Kanyakumari A tour to this place would result in a whole lot of fun and pleasure for the tourists. Kanyakumari is located in the southern state of Tamil Nadu and you cannot afford to miss out the sunrise and sunset while you are here for your vacations. The most fascinating feature of this town is its multi-hued beaches. 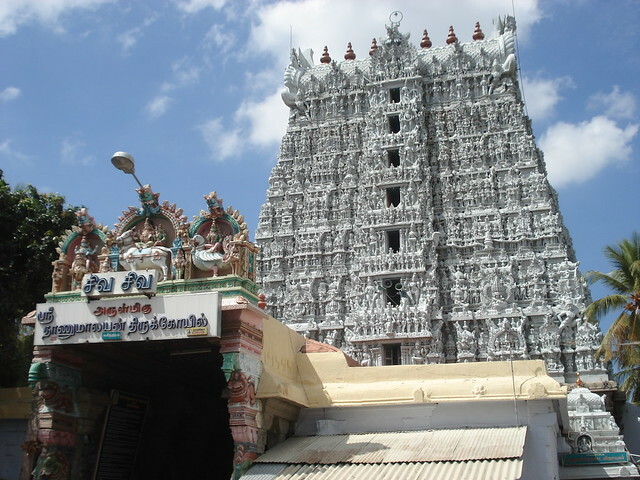 On your travel to Kanyakumari, you will come across the Kumari Amman Temple which is devoted to the goddess Parvathi. The renowned Vivekananda Rock Memorial is built in several architectural styles off the coast on rocks that project from the Indian Ocean. Kanyakumari was formerly known as Cape Comorin and is home to several historic sites that are many centuries old. The place is endowed by natural beauty which is unmatched by any other tourist destination of India. Tourism in Kanyakumari has led to an upsurge of the hotels that are located all around and form the ideal bases to explore the place.Kanyakumari tourism, Hotels in Kanyakumari, Kanyakumari Tour Packages, Temples in Kanyakumari, Tour to Kanyakumari, Travel Packages for Kanyakumari There are many categories of accommodations available in Kanyakumari and you can choose from any of the desired accommodation according to your taste and preference. The climatic conditions of Kanyakumari remain almost constant throughout the year and the winters are ideal for making a trip to Kanyakumari. Kanyakumari is home to lots of other tourist attractions including the Gandhi Memorial, Government Museum and Sripada Parai where the virgin goddess is believed to have set her foot. Lots of important landmarks are located close to the town and a day trip to those places would definitely make for a wonderful travel experience. Kanyakumari is also popular for its mouthwatering regional cuisine that is available in a large number of hotels and restaurants. There are many food and beverage outlets that are located near the important tourist attractions and you should not miss out the lip-smacking seafood which is served there. The affable people and their culture cast a spell on the tourist and they long to visit this place again and again. Kanyakumari is well-connected by air, rail and road transport. Kanyakumari tourism, Hotels in Kanyakumari, Kanyakumari Tour Packages, Temples in Kanyakumari, Tour to Kanyakumari, Travel Packages for Kanyakumari The nearest airport is Chennai and Thruvananthapuram which is located in the neighboring state—Kerala. Vacations in Kanyakumari are incomplete without shopping; various articles that are sold here include Handcrafted trinkets, seashell art and palm leaf drawings. Kanyakumari- Kanyakumari is located at the southernmost tip of India where the Arabian Sea, Bay of Bengal and the Indian Ocean meet. Kanyakumari has been an important centre for art, religion and trade for centuries. Kanyakumari is located at the southernmost part of India hence it is also known as the 'Land's End' of India. Beautiful beaches with multi-coloured sands, spectacular sunrises and sunsets, and ancient temples make this place a popular tourism destination. Legend has it that the princess Kanya Devi, one of the many forms of Goddess Parvati was supposed to marry Lord Shiva. But due to his inability to turn up on the auspicious time, the wedding never took place and hence the name, Kanyakumari. By Air: The nearest airport is at Thiruvananthapuram, 80 km from Kanyakumari. By Train: Kanyakumari is well connected by train services to all the major cities of India up to Delhi and even further up to Jammu. By Road: Kanyakumari is well connected by regular bus services to and from all the major cities of India. Being a coastal region, harboring at the confluence of the three oceans, Kanyakumari has a placid weather with little fluctuation to its weather temperaments. However the ideal time to visit is between October and March. 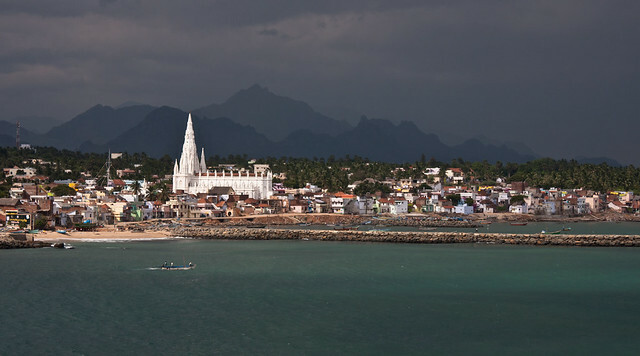 With the tropic climate, Kanyakumari has April to June the hottest with temperature reaching out to maximum 350C. November to February is the coolest period with temperature hovering around 210C. Northeast Monsoon brings gentle sweep of rains between October and December. Though there are several places of tourist-interest in the town and district, Kanyakumari is especially popular in India for its spectacular and unique sunrise and sunset. The confluence of three ocean bodies - the Bay of Bengal, the Indian Ocean, and the Arabian Sea - makes the sunrise and sunset even more special. On balmy, full-moon evenings, one can also see the moon-rise and sunset at the same time - on either side of the horizon. 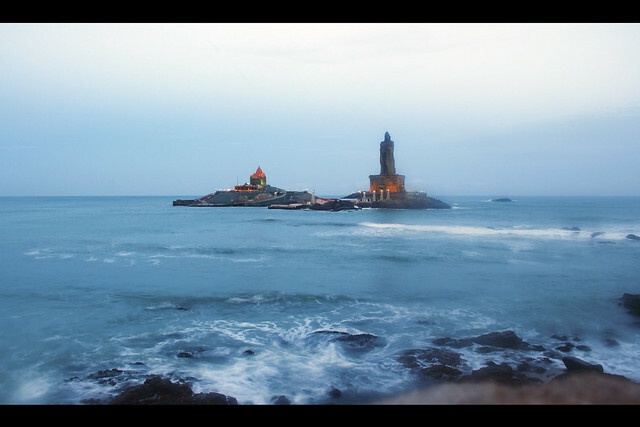 Apart from beaches, Kanyakumari is all known as a land of temples and memorials. One of the perfect places to visit during the trip is the government museum, which is situated in the Gandhi memorial road.Museum is a place where an individual learns about the history and the life of the ancient people. It is more of Informative and enlightening. It is a trait mark for the future generations to have wide knowledge in the different fields. India is considered to be the pillar of religious places. Because of the influence of British settlement in India, there were numerous churches built in different parts belonging to the community of Christianity. St. Xavier church is an outstanding church built in 1600 AD with an exciting structure.Recognized by St. Francis Xavier, who visited the coastal areas from Goa to Kanyakumari this church is world famous. During his stay at Kottar, he used to go to a small temple dedicated to St. Mary and offer his prayers everyday. Vivekananda rock memorial is a popular monument in the Kanyakumari district of Tamil Nadu. Thiruvalluvar statue which is 133 feet tall was built adjacent to this memorial. It ages four decades and is one of the most visited tourist spots in Kanyakumari ever since it was erected. It stands on few rocks amidst the ocean, just 400 meters away from Kanyakumari. 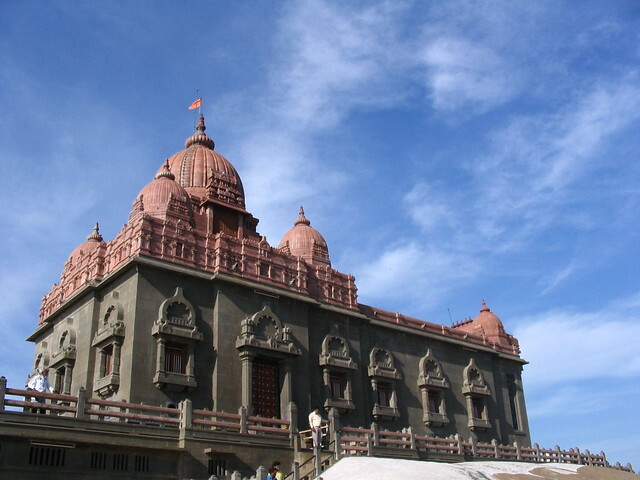 The memorial is dedicated to Swami Vivekananda, well-known spiritual philosopher who revived Hinduism in India. 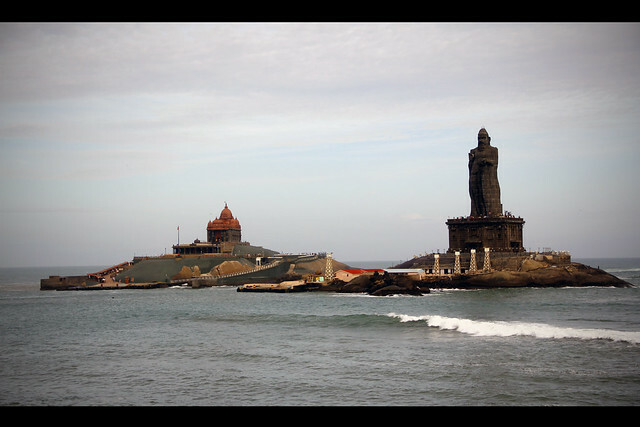 Among the tourist attractions in Kanyakumari, the most fascinating one is the Vivekananda Rock Memorial. It is here that Swami Vivekananda sat in deep meditation. The regular ferry services make it possible for the tourists to reach this place. Only after that, he resolved to serve his Motherland and spread the message of Vedanta. Kumari Amman temple is one of the main tourist spot in Kanyakumari and the trip would be incomplete without visiting the temple. It is considered to be a famous pilgrimage in India. It is a place which reflects the Indian Cultural heritages. This temple is situated in the center of the town and close to the seashore. The Kumari Amman temple is a perfect picture of impressive scenic beauty with waters all around.Kumari Amman Temple dedicated to Goddess Parvati, as Devi Kanya is an important tourist attraction of Kanyakumari. Kanyakumari is a well known tourist spot in India. The whole of city is filled with lovely sights. One such memorable place is Mahatma Gandhi memorial which stands for as a significance of cultural importance. It is situated at the seashore and close to Kumari Amman temple.This memorial was built to honor the great leader, who is known to be the “Father of Nation”. He was a good philosopher and a follower of Non-Violence. He died in the year 1948. It is also said that Mahatma Gandhi Visited Kanyakumari in 1925 and 1937. The memorial was built in the year 1952 on Gandhiji’s birthday (October 2nd), which was established with the intension of portraying the life of the great leader, Mahatma Gandhi, to the future generation. Gandhi Mandapam is built like an Oriyan temple; the uniqueness in its construction lies in the fact that on October 2nd, Gandhiji's birthday, the sun's rays fall on the place where his ashes were kept. The architecture of the temple is similar to the central Hindu temples and it is designed in a way so that the first rays of the sun fall exactly on the place where the ashes of this great personality were kept.Visiting this memorial will be more informative and pleasurable. Kanyakumari is the southern tip of the Indian sub-continent and holds wonderful structures, tourist spots and many pilgrim centers. One such town in Kanyakumari is Suchindram which holds a number of temples and is visited by numerous devotees every year especially during the festive seasons. Suchindram is a small town in the district of Kanyakumari and is located on the banks of River Pazhayar. Kamarajar is a veteran political leader of Tamil Nadu and a freedom fighter of India. He was also known as ‘Black Gandhi’ and played a vital role in bringing Indira Gandhi and Lal Bahadur Shastri to power as Indian Prime Ministers. He was born in 1903 and dedicated himself for the people as a politician. 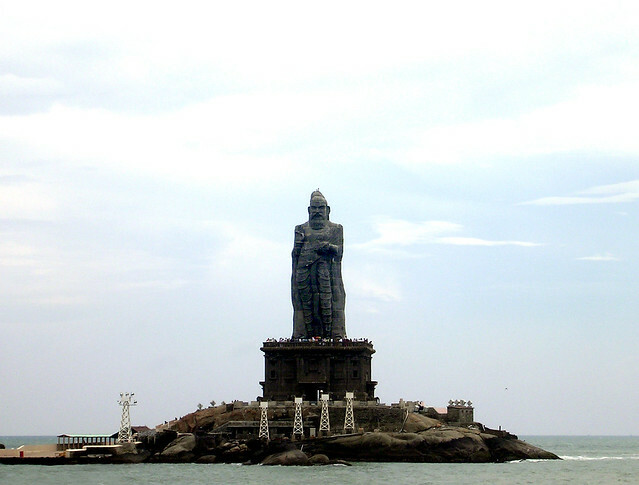 Thiruvalluvar Statue is a popular tourist spot of the Indian nation, standing tall in the Kanyakumari district of Tamil Nadu. It is one of the biggest structures in India and was established just a decade ago, welcoming the 21st century. Thiruvalluvar is the renowned poet and saint who lived in Tamil Nadu and has given a phenomenal work known as Thirukural to the world. Thirukural was rated as one of the bestselling books around the globe. There was a time when Kanyakumari was known to be the Alexandria of the east. After all Kanyakumari has been well-known for being brimmed up with fine examples of art, architecture, culture, sculptors and a lot more of these, which make the visit to the city a must. Besides this, the city is also known for its rich trade and commerce. Hence, over here you would come across to the best Kanyakumari tourist attractions where you would love to spend time at when you are over here for holidays. Goddess Bhagavathi Temple in Kanyakumari is picturesquely located at the confluence of the three oceans - the Indian Ocean, the Bay of Bengal and the Arabian Sea. Firstly Pandyas built this temple; Nayaks expanded it later. The image of the Goddess in the sanctum looks serene and beneficent. 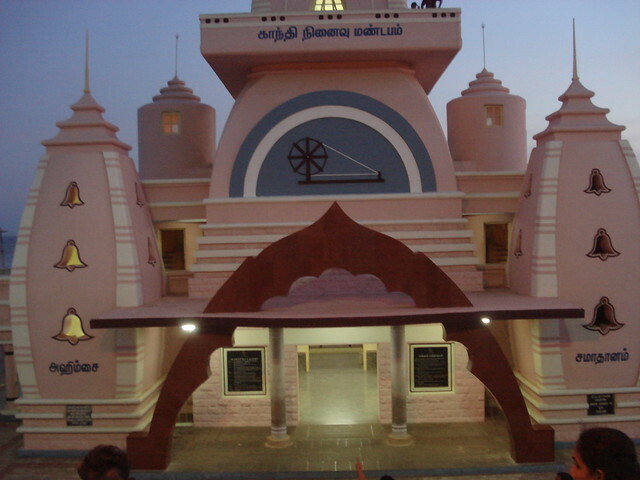 Alvar Tirunagari is one of the celebrated Vaishnav temples of Kannyakumari, Alvar Tirunagari temple is one of the nine sung of by the saint Namalvar. It is said that the saint attained enlightenment under a tree enshrined here. Alvar Tirunagari is dedicated to Lord Adinatha. Vattakottai is just 6 km from the city; Vattakottai is an 18th century fort overlooking the sea.